If you want to say something about a diagram or its content, no matter for what purpose, can create a post in PostMania. You can create a post to request change ("Delete this. 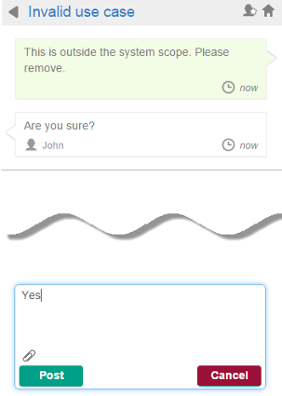 "), to ask for action ("Please implement this. "), ask whatever questions ("When will this be done? "), etc. Open the diagram that you want to create a post in it. 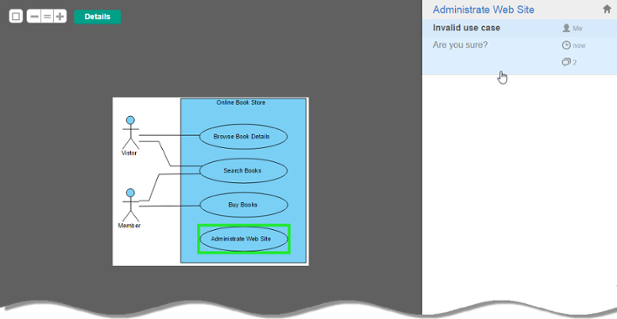 Click on the diagram background to make sure no shape has been selected. At the bottom right of the diagram, you can see a purple mark symbol. You can add marks to different parts of the diagram for the different areas of concern. Drag a mark onto the appropriate part of the diagram You can refine the position of mark by dragging it. If necessary, add more marks onto the diagram by repeatedly dragging and dropping the mark onto diagram. 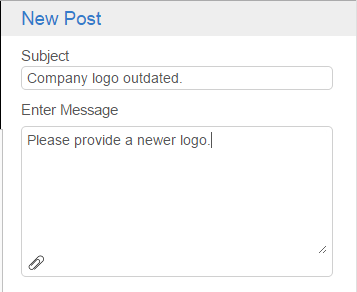 In the PostMania Topic Pane, enter the subject of post. Enter the messages of the marks. Click Post. Members who followed the diagram will receive Email notification about your post. Open the diagram that contains the desired shape. Click on the + buttom above the shape. You can also post comments to references of a shape, when viewing the details of a shape. At the top right of the page, click DETAILS. The description is then presented at bottom left. Open the REFERENCES tab. To say something about the references, click New Topic on the right hand side. You can also post comments to the flow of events of use case. Click on the desired use case in a use case diagram. Open the FLOW OF EVENTS tab. Select the steps to comment on. Click New Topic on the right hand side. Enter the subject and post content. 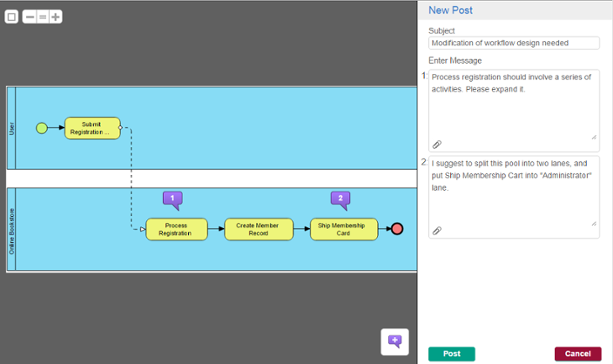 You can also post comments to working procedure of BPMN task/sub-process. 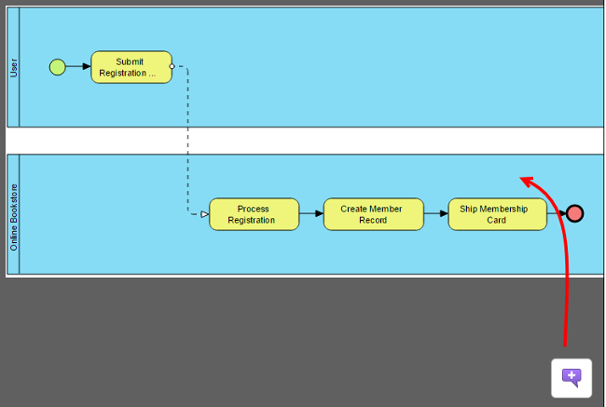 Click on the desired BPMN task/sub-process in a business process diagram. Click to open the desired post on the right hand side of PostMania. Enter the content of reply.